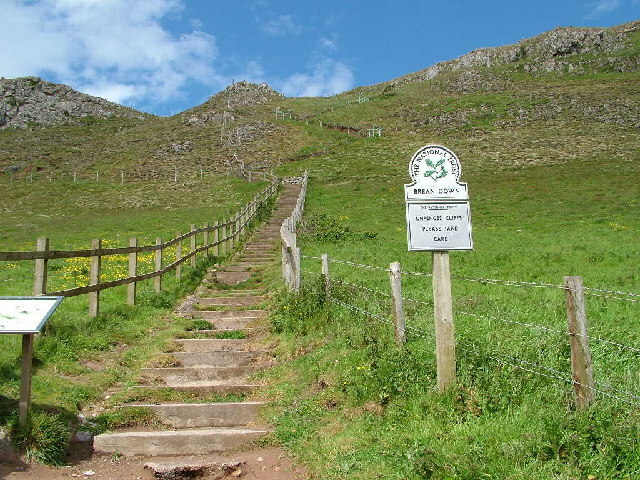 Poking out into the Bristol Channel at Brean in Somerset, Brean down is a limestone outcrop which reaches a height of 320 feet, and has attracted people since Pre-Roman times, when it is thought to have been the place of a pagan shrine. Various pieces of Roman coinage and prehistoric earthworks have been found at the site, demonstrating the length of human habitation on the site. Now in the care of the National Trust, the Down is a popular spot for visitors, with many taking a walk out to the Victorian Brean Down Fort at the end of the promontory, one of a group of forts known as the Palmerston Forts which were built to protect Britain from the French Navy. Arghh ....vivid distant memories of field trip in search of the White Rock Rose up a precipitous slope. My legs turned to jelly and my whole life flashed before me. Will stick to the fortress next time, it sounds great.